The study of bioactive components of the brown alga Ascophyllum nodosum (L.) Le Jolis has shown that they promote growth and increase productivity of plants. However, a standardized model system providing consistent responses to such bioactive components has yet to be established. Given that freezing stress, especially in northern climates, reduces plant growth and productivity, a technique was developed to protect plant cells under freezing stress using the natural products made from the abundant A. nodosum as a cell culture supplement. 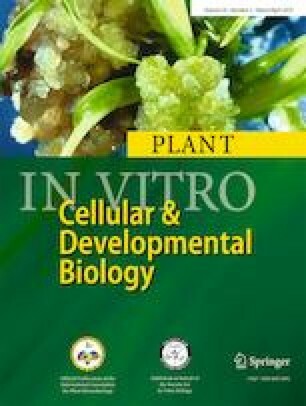 In this study, a homogenous cell culture system of Nicotiana tabacum L. cultivar Bright Yellow-2 (BY-2) suspension cells was used to investigate the bioactivity and protection level of this alga extract under freezing temperatures, and BY-2 cell growth, physiology, and molecular changes were measured in the presence or absence of the extract. The results indicated that A. nodosum extract significantly improved BY-2 cell survival after exposure to freezing temperatures. Inclusion of alga extract also improved cell growth, membrane stability, and nuclear integrity, and reduced cell death of cold-stressed BY-2 suspension cultures. It was concluded that A. nodosum extract influenced cellular and molecular regulation and triggered mechanisms, such as osmolyte accumulation and antioxidant activity, to combat freezing stress in BY-2 suspension cells. The online version of this article ( https://doi.org/10.1007/s11627-019-09972-8) contains supplementary material, which is available to authorized users. The authors would like to thank the government of Nova Scotia for providing through a Nova Scotia Research and Innovation Graduate Scholarship. The authors also thank Dalhousie University for providing Entrance and Graduate Scholarships, Natural Sciences and Engineering Research Council of Canada (NSERC) for research funding, as well as Acadian Seaplants Ltd. team for supporting this project. Sincere thanks are expressed to Drs. Dhriti Battacharyya, Tudor Borza, Pushp Sheel Shukla, and Sridhar Ravichandran for their consistent help throughout the study. BP designed and supervised the research. MZ conducted experiments and wrote the manuscript. AC and JN contributed in providing resources, supporting the research, and advising throughout the experiments. All authors read and approved the manuscript.